On a sunny spring day, David La Puma, the director of the Cape May Bird Observatory, escorted 20 birders to a phenomenal site in the world of migrating birds. Scores of laughing gulls crowded at the shoreline at Reed’s. Not a speck of sand could be seen beneath them. Flittering around them, sneaking through whatever airspace they could find, were some of the prettiest of shorebirds, known for their robin-orange heads and breasts: red knots. Despite the crowded shores, La Puma is concerned: this is nowhere close to the number of birds historically observed in this renowned migratory rest stop. This drop in population may spell trouble not only for the area’s biodiversity but also for its economy, as tourists from around the world come to Cape May to witness the bird migrations. New analysis by UCS suggests that we may be in only the beginning stages of that habitat loss. 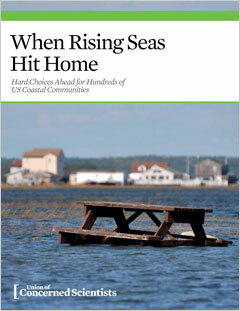 Given a moderate scenario for sea level rise, many Cape May coastal communities could see 15 percent or more of their land flooded 26 times or more per year, or every other week, on average, by the middle of the century. The birders watched as the red knots jostled each other, moving backwards in unison as waves came in, to peck at what the casual observer would assume was an ordinary strip of wrack pushed ashore. For the birds, the seaweed was the tablecloth for their version of a Michelin-starred meal; trapped inside the clumps were fatty horseshoe crab eggs. Somewhere along evolution’s path, red knots coevolved with the egg-laying cycle of the horseshoe crab. One female crab can lay 100,000 eggs in the sand over the course of a few days, and many end up in the wrack. The birds on the beach in Cape May had arrived from thousands of miles away in South America, utterly spent of fat. Stocking up on the eggs allows them to regain their migrating weight and to continue on to the Arctic. “The red knot is the poster bird, but a whole host of birds will probably lose habitat. They’ll lose their beaches, they’ll be squeezed out of areas between low marsh and high marsh, there’ll be changes in water salinity, you could go on,” La Puma said. Among the birds he fears will be sensitive to sea level rise are various species of sparrows, rails, owls, terns, and other shorebirds, including the threatened piping plover. An obvious way to help would be to preserve Cape May’s thousands of acres of natural habitat. That is a prime mission of the Wetlands Institute in the town of Stone Harbor. After Hurricane Sandy severely eroded beaches where horseshoe crabs lay eggs, the institute was a key partner in restoring critical spawning beaches in time for the next red knot migration. It is involved in several conservation efforts working to understand the best ways to preserve coastal resiliency and implementing projects to offset the effects of sea level rise on area wildlife, including horseshoe crabs, diamondback terrapins, and coastal birds. It also offers several education programs to promote marsh advocacy. Executive Director Lenore Tedesco hopes that whatever measures the Cape May region takes to prepare for sea level rise—including fortifying the wetlands as a natural sponge and barrier—are done in a way that does no harm. In many other resort communities around the country, a reflexive solution for rising seas and storm surges is to build waterfront homes higher, strengthen bulkheads at their foundations, and build higher seawalls. With many Cape May communities facing chronic inundation within the next several decades, one can imagine wanting to take the same approach here. According to a study published last year by researchers at the University of Georgia and Stetson University, Cape May County could see 38,000 families displaced this century by a three-foot sea level rise and nearly 80,000 by a six-foot rise. But more than half of Cape May County is protected open space, and Tedesco believes that open space holds much potential to protect both homeowners and wildlife.